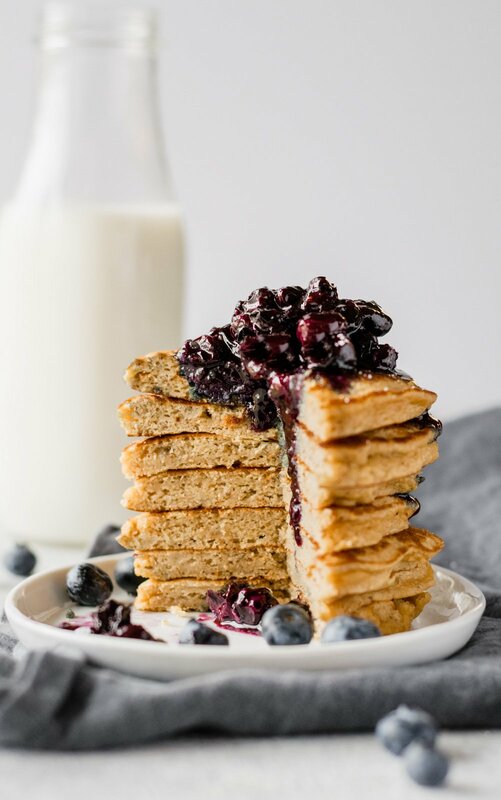 Amazing paleo banana coconut flour pancakes served with fresh wild blueberry maple syrup! So delicious and easy to make + a great source of both protein and healthy fats. I’ve gotten into a pretty solid Saturday routine where I head to a cycle class at Studio Three, then come home and make the FLUFFIEST, most delicious paleo pancakes. The nice part about weekend brunching at home? I can always count on Tony to make the bacon because you know, men and their meat obsession. SMH. 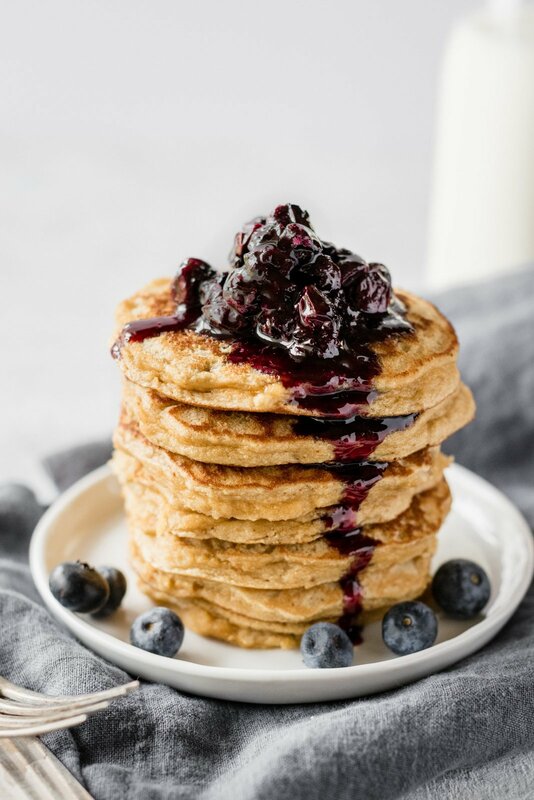 Currently, I’m SUPER into the paleo pancake mix from Bob’s Red Mill, I also love making my own homemade paleo pancake mix made with coconut flour aka these pancakes! The last time I baked Tony something with coconut flour in it, he fell in love and ate half the loaf for brunch. I was a little surprised because coconut flour has a little bit of a different texture and flavor, but obviously he enjoyed it. He actually does this with most of the food I make. I think I’m making a meal for 4 and it turns into a meal for 2; three servings for him and one for me. Coconut flour: All coconut flours seem to be a little bit different so you may need to add a little extra almond milk if that batter is TOO thick. Nut butter: Since I’m not paleo, I used peanut butter (MY LIFE OBSESSION) but almond or cashew butter would also work! Eggs: Most coconut flour recipes call for what seems like a dozen eggs. This one only has two because I love you. Mashed banana: Just a tiny bit helps to keep the pancakes nice and moist. Almond milk: I love unsweetened vanilla almondmilk. Wild Blueberries: Yes, wild blueberries are the BEST! I recommend going for the organic kind if that’s an option for you; this time of year they have the most delicious flavor. I actually went on a wild blueberry farm tour last year and learned all about the health benefits of wild blueberries! I hope you LOVE LOVE LOVE this recipe as much as I do. If you make them, be sure to leave a comment and let me know how they turned out for you! And if you’re on Instagram, snap a photo of your pancake creation and use the hashtag #ambtiouskitchen! xoxo. I recommend serving these with fresh organic eggs and a side of turkey bacon. Such a great breakfast. In large bowl whisk together coconut flour and baking soda; set aside. In a separate medium bowl, mix together the nut butter, eggs, honey, banana and almond milk together until smooth and well combined. Add wet ingredients to flour mixture and mix together. Note: If you find that the batter is WAY too thick (almost paste like), you can add in a teaspoon or two of milk until it is smooth, but still THICK. It will be like a thick brownie batter. Lightly coat a large nonstick skillet or griddle with butter or coconut oil and place over medium low heat (coconut flour is sensitive to burning so medium-low heat is best). Drop about 3 tablespoons of the batter onto the skillet; you may need to use a spoon to spread out the batter just a tiny bit. 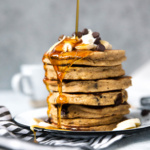 It's important not to place more than 3 tablespoons of batter at a time; the pancakes can be hard to flip if they are too large, so smaller pancakes are best. Plus mini pancakes are adorable, duh. It's very important to cook until bubbles appear on top and the edges are well cooked. Flip cakes and cook until golden brown on underside, 2 minutes. If you find that the pancakes are browning too quickly then you need to lower your skillet heat a bit. Wipe skillet clean and repeat with more melted butter or cooking spray and remaining batter. Makes 2 servings, 3 pancakes each. To make the syrup, place maple syrup and blueberries in saucepan over medium heat. Wait until mixture begins to simmer and boil, and stir every few minutes. Once mixture begins to breakdown and blueberries cook down about 5 minutes, remove from heat and serve warm over pancakes immediately. Nutrition information does not include blueberry syrup because everyone likes topping their pancakes differently. To make these completely paleo: Be sure to use a paleo-friendly nut butter. Please do not try and sub regular flour for coconut flour; the result will not be the same. If you make this recipe, be sure to leave a comment below and rate the recipe! You can also snap and picture and post it on Instagram using the hashtag #ambitiouskitchen. And of course be sure to follow Ambitious Kitchen on Instagram. xo! Jalapeño Sweet Potato Black Bean Tacos with Avocado-Lime Crema Weekend Favorites: our wedding video! 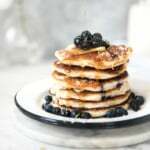 227 Responses to "Fluffy Coconut Flour Pancakes with Wild Blueberry Maple Syrup"
Coconut pancakes for the win! This recipe sounds amazing! I love that you included fresh blueberries, too! There’s nothing better this time of year! I am mostly vegan and love when you include vegan options…..would this work with flax seed egg subst? Holy blueberry galore! These pancakes are fuhmazing! Tony is a lucky taste tester! I love how tall and fluffy these pancakes are! They look absolutely phenomenal – I’ve already eaten breakfast today, but now I’m thinking that breakfast for dinner sounds like a good plan! Does anyone know if these would be considered Gluten free? I was looking for a recent comment on these pancakes. Ive been looking for a good paleo pancake recipe and it looks like i found it. Consistency has been an issue in previous recipes so i’ll see how this holds up, literally! I hope you get a chance to try these! I am a sucker for anything with fresh blueberries. These pancakes look so fluffy and I’ve been looking for new ways to use my coconut flour. I will have to give these a try! Ooooh, I just happen to have some coconut flour and almond milk on hand – perfect timing!! Do you think these would work in a cast iron skillet? Or will they probably stick bad? I made these in my iron skillet with coconut oil and they did not stick just a tiny bit but nothing terrible they turned out perfectly. Gah, I went to Eataly yesterday- There was some nutella bar, and it was epic! Almost as epic looking as these stack of beauties. Coconut flour = gold. Except when you chock on it… oops. I don’t think I could restrain myself from eating an entire stack of these fluffy pancakes! SO YUM. Oh my goodness, these look and sound delicious! I’m drooling and I’m totally making these for breakfast tomorrow morning now! They’re so fluffy I could DIE! Or, you know, just eat them all 😀 Love! This looks incredible!! I always like a new way to eat coconut flour. Can’t wait to try soon! Can you recommend anything to sub the apple sauce with? I want to make these but I have no apple sauce in my cupboard!!! You could try pumpkin. I’ve tried substituting the 2 tbsp applesauce for 2 tbsp milk, and that worked quite well. The great perks of being your boyfriend!! Have so much fun!! Wow these pancakes are too die for! That blueberry maple syrup is divine! 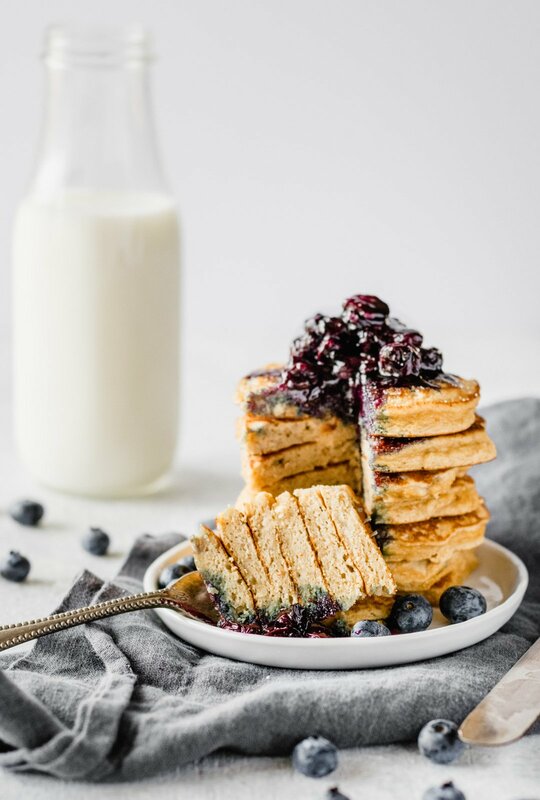 Oh my goodness that stack of pancakes is calling my name, blueberries are my favorite and these look fabulous! These are right up my alley!! Have so much fun with the BF! This blueberry syrup looks amazing! With these waffles, it is the perfect combination! It looks so beautiful! I love pancake in every variation but these one are awesome! I’m loving following along with your adventures while Tony is home on IG and Snapchat 🙂 You guys are the cutest ever. Also – thees pancakes look to die for. Lucky Tony! I made these this morning for my boyfriend’s birthday, and they were delicious! I have made coconut flour pancakes before and usually they don’t stay together/burn so quickly, but these were perfect! Plus the blueberry maple syrup was so good with them!!! Your pancakes look so lovely. I made these for breakfast and then again for dinner. The first time, they turned out too dry. The second time, they were quite tasty, but not nearly as fluffatastic. This is the first coconut flour pancake I have tried that I actual enjoyed. Thanks so much for this recipe. I didn’t have any maple syrup, but I melted a bit of Trader Joe’s reduced sugar blueberry preserves over some fresh blueberries and that made an awesome topping too. Super yummy and fluffy! I added a little bit of apple cider vinegar for even more fluff! Thanks for another great recipe! Haha! I factored in that I usually eat them with eggs and turkey bacon. You can portion them out as you so choose! 🙂 They are super filling. I’m glad you like them (saw your comment below!). These pancakes are so incredibly delicious!!! Most other pancake recipes using coconut flour turn out to be a total flop, but these are so fluffy, moist, and very filling! I, too used mashed banana in place of the applesauce and it turned out wonderfully. Was planning on only eating 2 per the serving size, but must say I snuck another one while nobody was watching. 😉 Thanks Monique for the fabulous recipe, as always! I’ve been experimenting with coconut flour pancakes all month and this recipe is by far the best one yet! I didn’t have applesauce (I’ve probably run out trying so many other pancake recipes) so substituted mashed banana and they were perfect. These looked amazing but when I made them they fell apart. I added some psyllium husk fiber and it helped a little.. I’ve had coconut and other paleo pancakes/waffles before but this recipe left a lot to be desired. Smothered in butter and maple syrup helped. 1 star. Fantastic recipe! I used pumpkin instead of applesauce, xylitol “honey” from Nature’s Hollow, and added pumpkin pie spice, a dash of ACV, lily’s stevia-sweetened chocolate chips and water instead of any milk. Top notch! I followed this recipe exactly, way too thick. I ended up using an additional 3/4 cup of milk. It’s one of those waste of time and waste of ingredients, I through the whole batch in the trash after the first one wouldn’t cook up. Tried to give one star, would not let me. I tried this just now – a cosy rainy Saturday morning after my first week (in months) of clean-eating and working out- really hit the spot. But I didn’t want to use so much maple syrup. To keep it slightly lower carb I used xylitol in the pancake batter, and for the topping (for the entire recipe)- 1 tablespoon coconut oil+1 tablespoon maple syrup instead of 1/4 cup maple syrup, worked well and was sweet enough for me, my tastebuds are sensitive to syrupy-sweet stuff 🙂 especially loved the way the blueberry syrup topping stained the pancakes. beautiful, thanks! Can I leave out the nut butter? I don’t have any on hand. Or what could I sub for it? No it really does need the nut butter! Thank you for this recipe! I tried to make coconut pancakes without a recipe and it resulted in egg tasting pancakes several weekends in a row. The only thing Is I prefer to use homemade Almond milk or sesame milk because Comercial milks have very little nutritional value. Im nsure why but they came out dry. Maybe I should add oil to the recipe? Hmmm! Did you follow the recipe exactly? The nut butter in the recipe should make them moist! HI there. I tried these pancakes not once but twice to the T – Both times came out horrible…dry..crumbly in pan..when done and you go to take the first bite they just are really dry and crumble apart. Not moist and unfortunately not an enjoyable breakfast 🙁 I did everything as stated – no substitutions. Ive only found and tried one coconut flour recipe out of dozens that came out perfect and then lost it so stumbled upon this on my quest to find it – Nice pictures and glad it worked out for some. I tried this recipe and the pancakes never cook through. I have done other recipes with coconut flour and always turned out good. Such a disappointment!! These are great!! My only recommendation- is that like with all gf pancakes- make smaller ones, because they are easier to flip, and stay together better. Thanks for a great recipe. I was pleasantly surprised! I have been really disappointed by other things I’ve made with coconut flour so I didn’t have much hope when I first saw your recipe. One thing that shocked me was that your recipe only called for one fourth cup of coconut flour–I thought it was a misprint because all of the other recipes were calling for 1 cup and 4 eggs. Anyway, you made them sound sooo delicious I decided to give them a try. They were Amazing! I made some changes by putting the wild blueberries into each pancake, and I also cooked strawberries down into a nice syrup and used that instead. Anyway, the real test was when I called my 13 year old daughter down to breakfast. This girl a kid who likes old fashion IHOP pancakes with lots of syrup. So when she looked at them and said ” Mom, what did you do here?” I knew I would get the truth. SHE LOVED THEM AND HAD SECONDS! So this recipe is a keeper thanks. The best part is that I didn’t get any after blood sugar reactions from eating too much sugar or carbs. Thanks! I made these this morning! If you put them in the oven and bake instead of pan-frying, they end up tasting like dog treats. Seriously! I have been totally grain and gluten free for years. I rarely make cakes,muffins and cookies because it’s hard to find that perfect texture without drying your mouth out. This was the 4th attempt at making grain free pancakes and I must say….. thank you. I felt like I stopped in a mom and pop or IHOP and enjoyed real pancakes. I have a feeling of fulldillment. Just amazing. OMG best coconut pancake recipe I’ve tried yet. I actually made waffles because they are faster & cook on both sides at once and they were perfect. Fluffy moist and so delish. Thank you! These were fantastic. I have a bunch of coconut flour to use up and I’m thrilled to have a tasty way to use it. Thanks for the great recipe! I have been experimenting with coconut flour and had a success (flatbread from Arman at thebigmansworld.com) and a failure (blueberry muffins from Standard Process recipe). I researched the heck out of cooking with coconut flour, and as Monique and many point out, you need a lot of liquid/moisture for this dense stuff. I was intimidated by all the pancake fails out there, so I took the advice I read elsewhere (can’t remember) and made waffles. PERFECT waffles! Followed Monique’s recipe to the letter, using Bob’s Red Mill coconut flour (because it’s what I can get) and fresh ground almond butter (there’s a machine at a store close by and you grind your own). I heated my waffle iron and brushed it with coconut oil. I made 4 medium sized waffles, 2 each for my husband and me (so you’d have to adjust the calories accordingly). Made more of a blueberry compote, using 1 T maple syrup. AWESOME!!! I have a picture, will try to post it elsewhere. So, don’t give up if you have a bad turnout…keep trying! Thanks, Monique! I just made coconut flour pancakes for the first time. I was so starved for pancakes, that I ate them, but my husband asked me politely to never make them again. Well, I am gluten free and very low carb, so I had to research another pancake recipe. I found yours, and with all your rave reviews, I am going to give it a try. Thank you! These are awesome. I added some organic cocoa powder and used strawberries instead of blueberries….. Soooooo yummy. My 2yr old devoured them. I followed everything but the baking soda I didn’t have any ? Instead I added baking powder. They turned out great I would just rather not add nut butter to mine next time. Or add something other than peanut butter it’s too strong. My for year old almost liked them until I told him it was coconut pancakes but my 18 month old loved them. My husband and I have made these countless times now. It’s our go-to Sunday morning pancake recipe, and our 3 year old gobbles them up! I make them exactly as the recipe states (sometimes omitting the topping and just using maple syrup or fresh fruit and yogurt) and they turn our perfect every time. Omg ! These were delicious !!! Ive tried several different coconut flour recipes and bybfar this is the best !! Only thing Im allergic to bananas so I just added a tbsp.of almond oil from the almond butter. Also I have a gas stove so my burner is big so I cooked on low. Not med.low but low. Love em !! Thank you for sharing this recipe !! Just made these. So good. Thank you! ? These Coconut Pancakes were amazing better than normal flour pancakes !! :O so fluffy and tasty, mmmm It was a bit thick at first but just added extra milk and was creamy. Fun and easy to make highly recommenced. These were excellent using the coconut flour and following the recipe exactly! Since i am trying to avoid sugar i found them quite sweet tasting. Did not make the blueberry sauce. I failed to see this only made mini pancakes and had to whip up a batch of regular pancakes as this was not enough.i was out of almond butter, i used the banana and honey but next time would use the applesauce. Awesome recipe and will make these again but double or triple the batch. 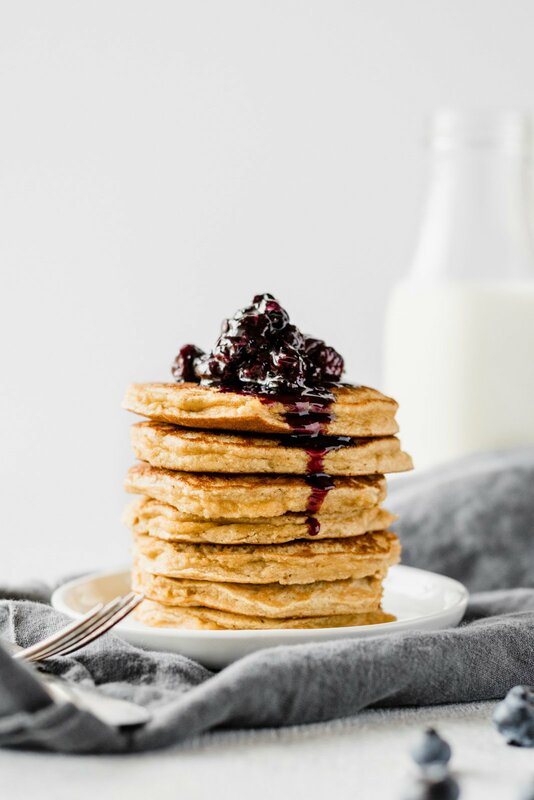 Wonderful pancake recipe, I used coconut butter and replaced a tablespoon of coconut flour with peanut flour and they came out amaaaazing. Also, pumpkin pie spice works incredibly well with these, thanks for sharing such a bomb recipe! Figures I try this recipe the one day I do not have bananas; so, I substituted ~1/4 pound of sweet potato and the result was great—very buttery and compliments the nutty ingredients. Boy these sound good. Great recipe, thanks for sharing. I don’t see applesauce in the recipe…..how much would I use? You can replace the banana for applesauce if you want. I would use 2 tablespoons. I just tried those and didn’t like very much. They were falling apart as I was baking them. They also taste grainy. I didn’t have any coconut flour so I used 1 cup of almond flour instead and they turned out great. Thanks for the recipe! Was pleasantly surprised that this was fluffy as described. I followed the recipe using 1/2 banana not applesauce was confusingly mentioned in the post. Maybe either can be used? The best recipe for coconut flour pancakes. I’ve substituted banana with a large apple. Tastes great! Use only one tablespoon of real honey. Hey hun, just wondering if the applesauce is supposed to be a part of the recipe? Because you mention it before but it’s not included!? Thanks! I decided to try this recipe because I was craving pancakes. They look delicious! I’m not fully paleo, I’ve been gluten free for a while and am dabbling in grain free eating. This recipe didn’t work well for me. It was dry, dense and tasted like bananas. I really hate bananas, but usually am good with them in baked goods. I tried adding cinnamon to add more flavor, but it didn’t help. HUGE DISAPPOINTMENT! I am an experienced cook, and have tried several coconut pancake recipes including this one today. All were better than this one. I ONLY WISH I HAD READ THE COMMENTS (of people who actually make them!) BEFORE WASTING MY TIME. There were many problems with it. In the first place it takes way more than 20 minutes. The overwhelming majority of positive comments came from people who didn’t even make the recipe. They liked the idea or the pretty picture. I can’t believe Carino called me a bloviatah–that’s not much love from a fellow paisan. I still don’t undehstand, Carino, why you have a blog devoted to basketball all year. Don’t you know basketball only mattahs from around March 16 to April 5? That’s the only time I follow it.Uhhhh, Eddie, look up how many hits Carino gets with that blog of his. . . Heeeere’s the Mink Man. I replaced the real eggs with flax eggs and they didn’t work out. So if you don’t tolerate real eggs this may not be for you. Of course you could try a different egg replacer. In the blog above the recipe, it says applesauce, but in the recipe itself, there is no mention of applesauce. Did the original recipe have applesauce where the mashed banana is now? I followed the recipe exactly and these are amaze balls! Seriously so so good. Tricky to flip, just make sure they’re browned before you try to flip ’em. Yum! THESE ARE PHENOMENAL GF PANCAKES!!!!! We didn’t put any topping other than butter. They are delicious in and of themselves. I had to rate this recipe after reading all of these awful reviews. I’m not sure what went wrong for them – but these are great. I have used coconut flour to bake a variety of things and have never found a pancake recipe that is actually fluffy!! You have done it. I’m not sure if this recipe is updated from before, because I didn’t see any applesauce in it. Whatever the case 5/5 stars for sure!!! 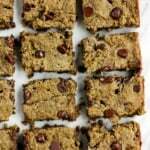 Just made these this morning using sunflower seed butter and they’re SO GOOD! Light, fluffy, not much coconut flavor, and all around delicious and easy to make. My roommate also loved them. Safe to say these will be a weekend, homemade brunch staple going forward. Hi! 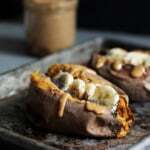 I made these and loved them but noticed later that you talk about applesauce in the article but list banana in the actual recipe. Am I supposed to add banana and applesauce? how much applesauce? Hi, I had issues blending in the peanut butter. Any suggestions to make it blend in smoothly? Hi Christine! You could try mixing with a fork to get the peanut butter chunks out, or add a bit more almond milk if your batter is paste-like! Well, instead of nut butter, since I had coconut oil (which is hard like butter at room temperature), I used that instead. The pancakes seemed lovely, soft and fluffy coming out the pan, but eating them they felt sort of spongey-mealy. Is that because of the oil? Or is that how they turn out with nut butter, too? Should I let the coconut flour rest a while in the moist ingredients to let it soften and soak up the moisture? Or is just lacking gluten mean they are not going to have that nice stretchy texture of wheat flour? Hi Nate! I think the consistency issue came from the coconut oil. Nut butters like peanut and almond butter help these to hold up nicely, and the addition of oil is likely what caused them to be mealy! We have tried quite a few pale type pancake recipes and this one rates right up with the best. Like that it has a balance of not too much of any ingredient. Only added some cinnamon. Will look forward to trying some of your other recipes. Thanks. So happy to hear that! I hope you find some others here that you love, too 🙂 Enjoy! These were hard to get thin, but very tasty. Since we are traveling, I can’t make my coconut flour muffins. These are a delicious substitute! I’ve always liked peanut butter on my pancakes so the peanut flavor is fun. Now if only i had brought cinnamon! Perfect! Happy to hear that these work for you while traveling 🙂 Love peanut butter on pancakes – enjoy! Made these this morning for breakfast! We didn’t have any blueberries so we used frozen cherries instead and added a dollop of Greek yoghurt on to our pancake stacks. It’s lovely recipe and will definitely be making them again. YUM!!!!!!!! Amazing! Cherries sound delicious in here. So glad you enjoyed them! Finally a delicious coconut flour pancake recipe!! My kids are gobbling them up! I made these nut free with sunbutter and coconut milk and they turned out Great! Thanks so much!! I love to feed my kids foods they like but with health benefits. I forgot to add I replaced the honey with 1 date thrown in the blender wirh a bit of coconut milk. Delicious! The description mentions apple sauce but I don’t see it listed in the recipe. This recipe is a really good pancake. I always make at least a double recipe, because they all get eaten. I make for my paleo eating wife and have have modified slightly without a problem to increase protein and beneficial fats. For a double bathc, sub 1.5T of peanut butter powder (Nocal Organic in my house) for the peanut butter. Add 1T Flax meal. Other mods – I have used almond butter, tahini and peanut butter with great results. Chocolate – 1t of cocoa power while reducing the coconut flour 1/2t. Next for me is to get this to work in a waffle iron. Delicious! Glad those swaps work out for you 🙂 Let me know how the waffles go! Wild blueberries are the best! So much more flavor than the regular ones. I’m all about delicious pancakes!! I love adding the pure maple syrup to mine too! These look amazing! You’re one of my all time favorite food bloggers! I hope there is a way I can make this recipe vegan-friendly! Will let you know if flax eggs work with this beautiful stack of pancakes! These are so happening this weekend! Woot woot I hope you loved them!! Hey! I really want to make these pancakes but can I substitute the eggs for flax eggs??? Hey Gia! I wouldn’t recommend flax eggs as I don’t think the pancakes will hold up very well. I love a lot of your recipes!! But i hated this one.time consuming.dense. too moist. I subbed coconut milk and omitted the nut better. Don’t no if that’s why it came out bad. Tasted more like a wet banana bread.my daughter did like it tho and ate a lot of it LOL. She thought they were cookies bc i had to make them really small. I recommend keeping the nut butter in to maintain the consistency! If you used full-fat coconut milk, too, it could’ve changed the batter a bit as it’s thicker than almond milk. I don’t normally comment on these posts but these were delicious! I subbed the almond milk for regular, and a small amount of the coconut flour (10g) for protein powder and they were perfect! Perfect!! I’m glad the protein powder worked out in here too! I usually don’t comment on these things but oh my gosh these pancakes are ridiculous. You don’t even need syrup.thats how good they are. Thank you so much. Even my picky toddler ate them up with out protest. I can’t wait to make them again. I made these this morning. It was my first attempt at paleo pancakes. They were pretty good. I found them to be a little more dense than I would like, but the banana I used wasn’t as ripe as I would have liked it to be. I’m gonna try them with applesauce next time and see if they are a little lighter. Would definitely revist this recipe though because my husband loved them. Made them for my 9 month old. Had to make them super tiny to cook through and they came out very dark and very banana flavored. Not too thick at all but I put the batter in my blender to mix the natural peanut butter in sincr it was crazy thick. Ok. Not awesome but pancakes! Sorry to hear that, Samantha! I’ve found these to be fluffy (like the photos). I would maybe double check your liquid ratios in here – mixing in the natural, drippy peanut butter by hand might help the consistency! I made these exactly as written BUT I baked them in an 8 x 8 inch pan at 350F for 20 minutes. YUM! These truly do live up to their name. They are so fluffy! Plus, I thought they tasted like banana bread. I served these with some homemade blueberry chia jam & banana and felt so good about eating them…unlike normal sugar bomb pancakes! That sounds delicious – I’ve never tried baking these before! Homemade blueberry chia jam YUM. Thank you so much for this idea! Baking the mixture worked like a charm this morning! Mixing the batter is quick and, after in the oven, I am freed up to take care of the other parts of breakfast. I substituted 2 Tbsp of applesauce as Monique suggested in an earlier comment for the banana. I also used “non-drippy” peanut butter, Earth Balance with flax to be exact. Added a dash of vanilla extract and cinnamon. I put parchment paper in the pan and sprayed it with coconut oil because I wasn’t sure if the mixture would get stuck. I think one or the other would have been fine, I didn’t need both. I wasn’t sure what the blueberry syrup consistency was supposed to be a mine did not thicken as it cooked down. I’m not disappointed because it still tasted great! I’m sure it was because I used frozen blueberries that I thawed. I probably should have put the blueberries in the pot, allowed a lot of the moisture to evaporate as it heated and then added the maple syrup. No more pancake flippin’ necessary for me! Oh my goodness. What awesome pancakes! Thank you for the recipe. I am going low carb so I substituted Lakanto Maple syrup for the honey and maple syrup. It was delicious! Also So-delicious unsweetened coconut milk for almond milk. Totally amazing! Both my son and I loved them. Perfect! I’m so glad you and your son loved them 🙂 best breakfast! Hi Monique, Im not paleo but trying to avoid wheat flour. 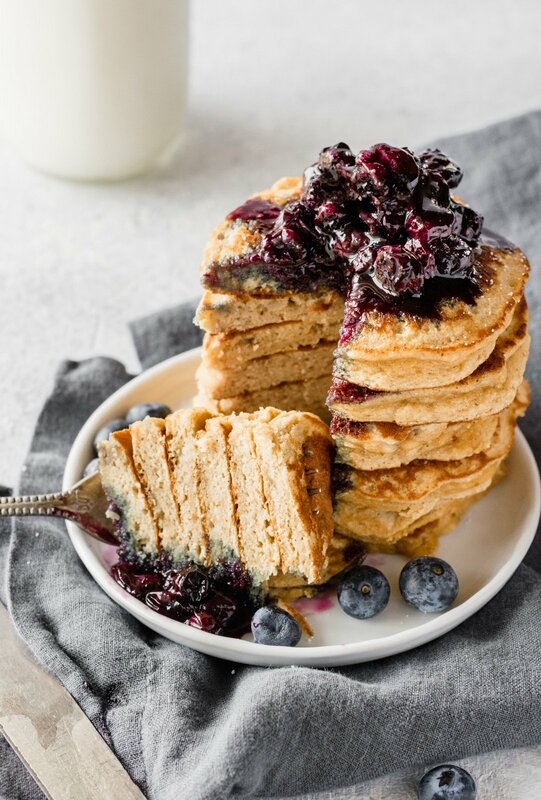 I found this recipe when searching for pancake recipe using coconut flour. I had some leftover berry sauce from a dessert I made the other day & since it’s Saturday morning I thought I’d treat myself. Yours is one of few not loaded with eggs so I made these using peanut butter & reg milk b/c I don’t have almond milk. They came out FANTASTIC!! Love them!! Thanks so much for sharing! Question: I will use this from now on whenever I make pancakes (will make sure I always have almond milk in) but while I like peanut butter I don’t always want that flavor in my pancakes. Can you suggest some other substitute?? Thanks so much!! Hi Nilma! Amazing!! I’m so happy you found this recipe 🙂 You can use any other nut butter you’d like – I’d suggest cashew butter for a more mild taste. I just made these this morning for my niece and son both 2 years old and very picky eaters! I used the apple sauce because I didn’t have a banana, used skim milk, and light corn syrup, only because I didn’t have some of the others.. I was kinda scared that they wouldn’t be good because of me having to Substitute s substitute so many ingredients. But they where a hit! My son hasn’t been eating much in the last few days only wanting cookies and candy but he ate a whole stack! At least 4 (mini pancakes) and my niece ate 3! Thank you so much! I’ll be making these a lot more often! Oh and my son didn’t even use syrup just the pancakes by them selfs ! (He won’t eat sticky food) so they where great!! I’m glad those swaps worked out and that the kiddos love them! Such a good go-to breakfast! Enough philosophozing. Nobody cares about all the bs. Just put the recipe at the top. Hi Pete! Ambitious Kitchen is my personal platform to share delicious recipes + a healthy dose of my personal life, which allows me to connect with readers. I include photos so that readers have a good visual of what the recipe looks like, too. Thanks! Hi! It should be about 28g. I’m sorry. Though the flavour is great, the texture is disgusting. Dry, crumbly, and just gag worthy. There must be something extra I can add so that I don’t waste all of these expensive ingredients now and have to revert to my trusted and true GF flour pancake recipe. What a disappointment. Sorry to hear that you didn’t like these! They’re one of my favorite pancakes, and I never have an issue with them being dry. I would be sure you’re using an all-natural nut butter when you make them. Finally a recipe that works! And tastes amazing. I followed the recipe exactly, but left out the banana. I used tahini for my nut butter. The consistency was perfect and the pancakes were so fluffy! Great! So glad you loved them! These are really nice. I subbed applesauce for the banana (allergic), left out the sweetener and made a blueberry compote without sweetener and the breakfast was amazing! Glad those swaps worked out for you! Perfect breakfast. I made this one, and it was great!! Thanks Monique! Amazing! Happy to hear that, Heather. I have tried several coconut flour or almond flour recipes and this is the best one yet. My husband said he couldn’t tell the difference between these and regular pancakes! Thank you for sharing this! Amazing! So happy to hear that. Hi there! The batter smelled delicious and the ingredients list is right up my ally. I doubled the recipe to make a good amount of pancakes, but that is where everything went south. It was too much baking soda when I doubled the recipe and I had to throw it all out. Any idea what the measurements should be when wanting to make more pancakes? That’s odd! I’m sorry you had an issue when you doubled the recipe. Perhaps try to leave the baking soda amount as is when doubling the recipe. Let me know how it goes next time! These are great! I have tried several variations of coconut flour pancakes over the years, but they were always too heavy and eggy. I love that you used banana and didn’t need coconut oil in the actual pancake. I substituted water for almond milk. Turned out wonderfully! Perfect! So glad you found these – one of my fav coconut flour recipes. Sorry to hear that! I would double check your ingredient ratios in here. Mine turned out pretty good. I used peanut butter, plus I added about 1/3 c PB powder. I had to add additional milk to thin the batter and I made small pancakes as recommended. Also, Monique was right, you do have to watch the heat. I normally make pancakes at 350, but these need around 300 and you need to let them cook on one side until they hold together when flipped which seemed longer than regular pancakes. Thank you for the recipe! Glad those additions worked out! Perfect breakfast. Hi! I tried this recipe, but with flax seed to replace the egg (according to the flax seed bag recommendation) and it was a colossal flop. Any suggestions for success for a vegan recipe? Thank you!